So, the story behind this dessert’s nickname is that I brought it to a recent get-together with some friends, and when people started asking what it was, another friend was quick to call it “Jello salad.” Only everyone else heard “jungle salad.” So I’m not sure what everyone was expecting when I cut into it … wild berries, plantain leaves, tropical edible flowers? 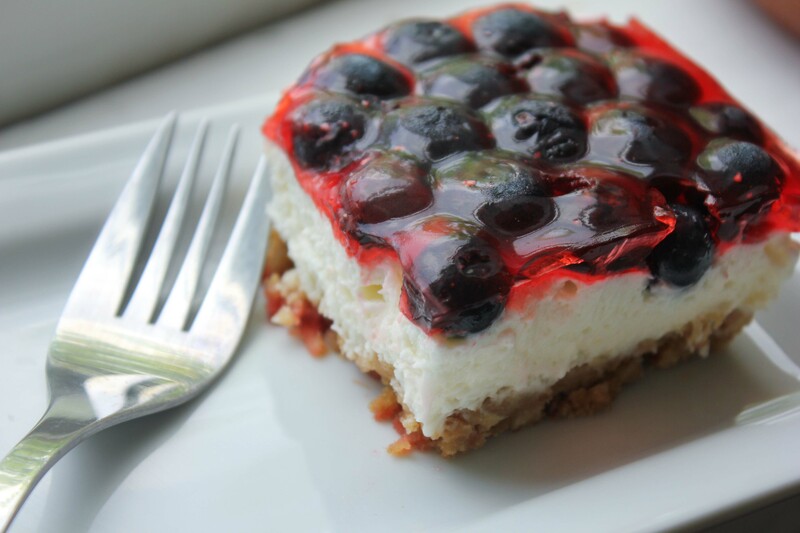 Nope, this is red, white and blue pretzel salad: sweet, salty, creamy and light. And I’m naming it my signature dessert of the season! Preheat the oven to 350 degrees. In a small pan, melt the butter slowly, and add the pretzel crumbs. 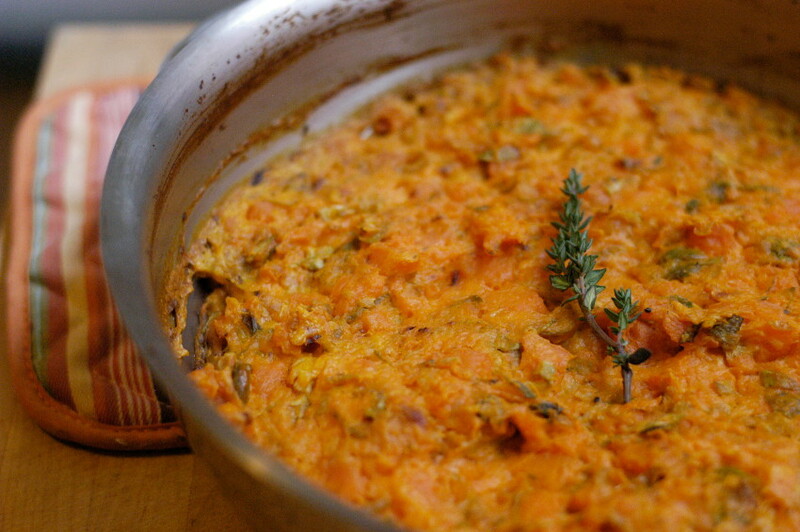 Stir constantly for about 2 minutes, then transfer the mixture in a 7″x7″ glass baking pan. Use a piece of wax paper to pat down the pretzel mixture into a flat layer at the bottom of the pan. Bake for 10 minutes, then transfer to the fridge so it can cool quickly. Meanwhile, use the whisk attachment of an upright mixer or use an electric hand mixer on high to whip the whipping cream and 1 teaspoon sugar. When the cream has stiffened some, after about 1 1/2 minutes, transfer the whipped cream to another bowl. Add the cream cheese to the bowl of the mixer and beat until it softens, about 1 minute on high. Add the whipping cream, and beat to combine, about 30 seconds. Refrigerate. Bring the water to a boil in a small pot. Pour the boiling water into a medium glass bowl, and add the gelatin mix. Stir with a whisk for 1 minute, or until the gelatin mix dissolves completely. Refrigerate for 1/2 hour. When the gelatin has just started to set, it’s time to assemble the layers of this dessert. Pour the cream cheese mixture over the pretzel crust, and use a spatula to carefully spread the mixture over the crust. (Try to work from the center of the mound of cream cheese mixture out. It’s easy for crumbs to surface as you spread.) Next, arrange the blueberries in a single layer over the cream cheese mixture. 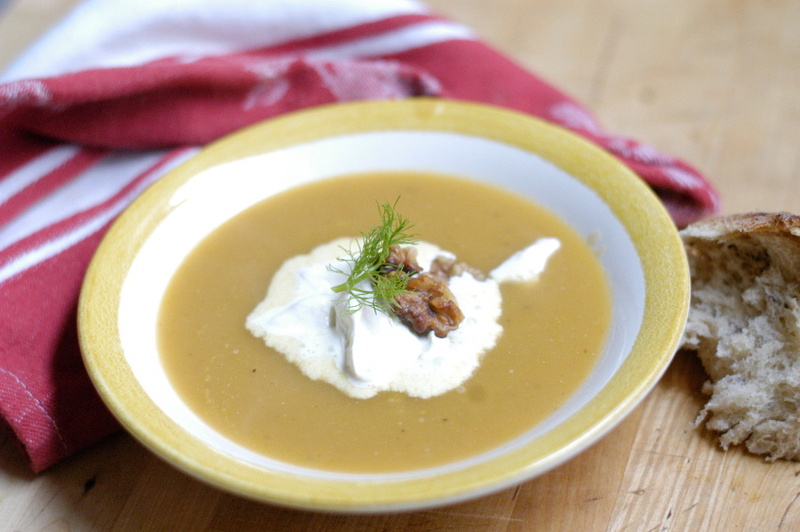 Pour the gelatin over top, and refrigerate for 1-4 hours before serving. A little throwback to our January hot chocolate guide, yes? Combine whipping cream and sugar. Beat with an electric mixer until you reach a whipped cream consistency. Add vanilla and combine. Place in the freezer. In a small sauce pan over low heat, melt the chocolate and combine with nutmeg. Add milk and bring to a boil, stirring constantly. Let cool. Pour into an ice cube tray and freeze. 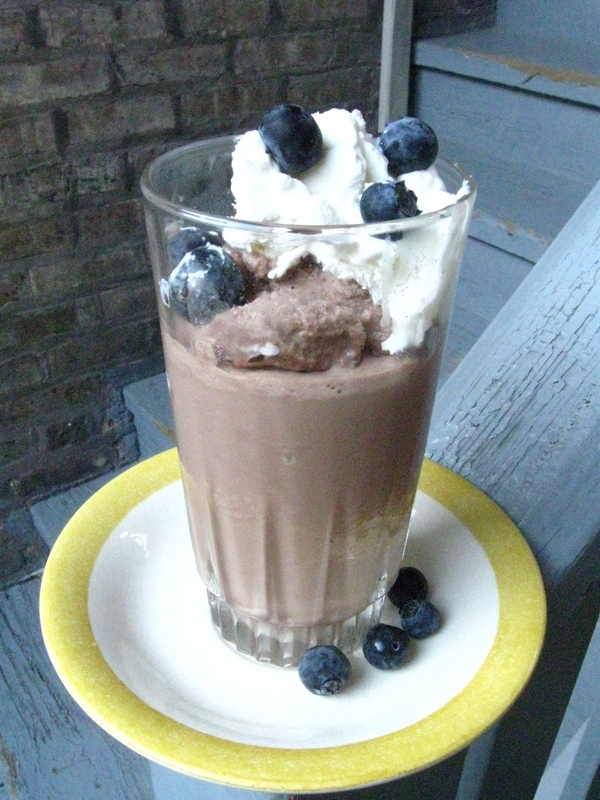 Place the frozen hot chocolate into a blender and pulse, slowly adding a little additional milk, along with two regular ice cubes and a dollop of the frozen whipped cream. Pulse until smooth. Serve with summer fruit and a spoonful of the whipped cream on top. *Throughout June, “Freeze These” will feature our favorite frozen dessert recipes — all of which can be found here. 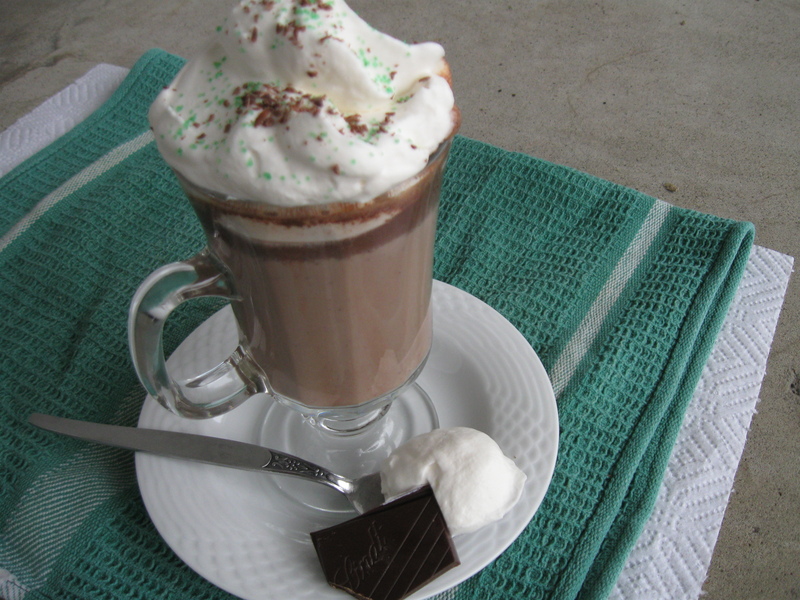 I wish I would have thought of Irish hot chocolate when I had snow days in college. Combine the two. This isn’t so much a recipe as it is a good idea. And you’re welcome. Whip cream until white peaks begin to appear. Add the sugar and vanilla and beat a little more until it’s at a whipped cream consistency you know and love. Makes about two cups. Add to your Irish hot chocolate and garnish with some shaved chocolate. Dab a little of the whipped cream on your nose for extra pizazz. *During the month of January, we’ll post six hot chocolate recipes as part of Loving Cup, all of which can be found here.